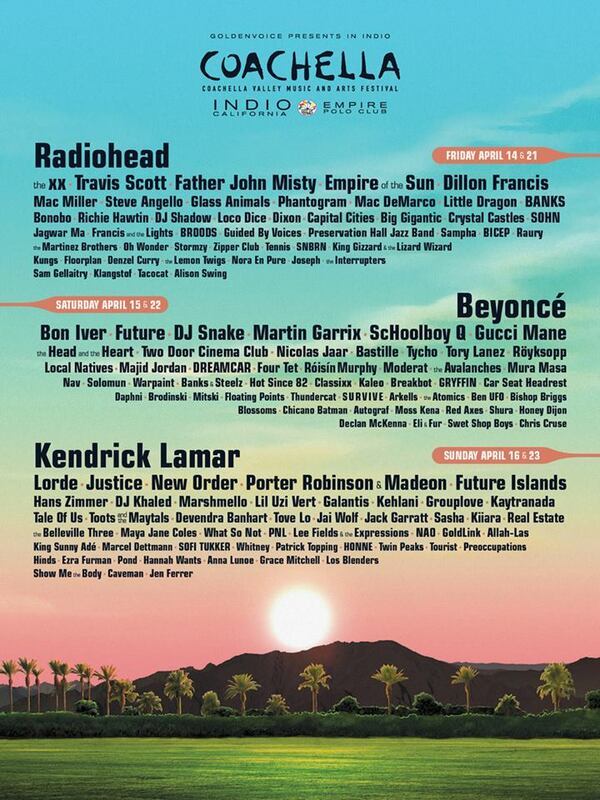 Have you seen the Coachella lineup? Radiohead, Lady Gaga, Kendrick Lamar and Martin Garrix to name but a very few…. Then again the desert based festival never disappoints when it comes to music…. I’ve been to Coachella twice already, 2014 and 2015. Both trips very very different so it seems only right that I give you all the tips and tricks if you are considering making it one (two for me) of the most memorable holidays…. Flights: VIRGIN ATLANTIC! They are the only airline I would recommend. And no not only because of the FREE bar…(because of the free bar)…. But they are the best. The staff are all friendly and very accommodating, great in flight entertainment and comfortable seats in economy. Travel: If there is a group of you I would suggest hiring a jeep/ van and drive to the festival. It is approximately 2.5 hours from LAX. Campsites open the Thursday before the festival and I suggest arriving early to get the best possible area to pitch your tent, beside the toilets/ showers and power points. Camping: Each year I have stayed at the SHADOW HILLS RV Resort. You can camp on the Coachella site but this place is a gem. During the two weekends of the music festival the site fills with festival goers and they cater for the young, vibrant guests. They have proper bathroom facilities and hot showers. AND they have a SWIMMING POOL! And not only that but each morning before the festival kicks off they hold pool parties. Last year they flew DJ Reaal in from Miami. You can also drink around the pool, catch some rays, go for a dip before you get the frills and crop tops on. The staff are so friendly and join in on the celebrations. * Shadow Hills is a bus ride into the grounds but buses run throughout the day and into the night. Camping Gear: The first year I went alone to Coachella so I pre booked a tent from the kind folk in the RV Resort. BUT last year we got everything we needed from Target. Any of the large department stores have a camping section so once you land in LAX and get some wheels make your way to the closest store. * Pick up a gazebo and camping chairs because it gets hot at the campsite and a cooler for the booze. * Stock up on breakfast bars and plenty of fluids for the weekend. Festival Gear: You will be in the dessert heat so less clothing is desired. Pack the sun cream though! You can bring bottles of water in with you and make sure to have some for the walk into the main grounds. In the blistering heat it is needed. You can buy these water bags that you can fill up inside the main grounds that are super handy. Locker: You can hire a locker inside the festival which is a must! We did it last year meaning we could place jumpers and jackets into it because once that sun sets, the cold creeps in and suddenly crop tops and hot pants are not ideal. Drink and Food: You can get loads of food inside the festival grounds. Really healthy, tasty, American food, fresh fruit smoothies etc. You CANNOT walk freely around with alcohol. They have designated bars dotted around the area. I suggest getting in with your friends to a bar, enjoy a few drinks and head out to catch some bands and acts. The Heineken bar has water sprays that are dreamy during the blistering heat. Then there is a bar with a lovely green area that you can lie and chill. That’s pretty much it for Coachella. If you want to know anything else just get in touch.